Healthy Living Challenge: Day 26 – 5 Ingredients, 50 Minutes, 500 Calorie Dinner! Yeah, so this morning I had no desire to slave in the kitchen, like I did yesterday. You see, I cook my dinners in the morning when Emma is in playgroup because there is no time to do it in the evening, after we come back from work. And I also like cooking in peace :-). Yesterday I made my lean turkey stuffed peppers but it took me pretty much all morning so this morning I popped into Sainsbury’s, grabbed a couple of ingredients and had my dinner ready in less than an hour. 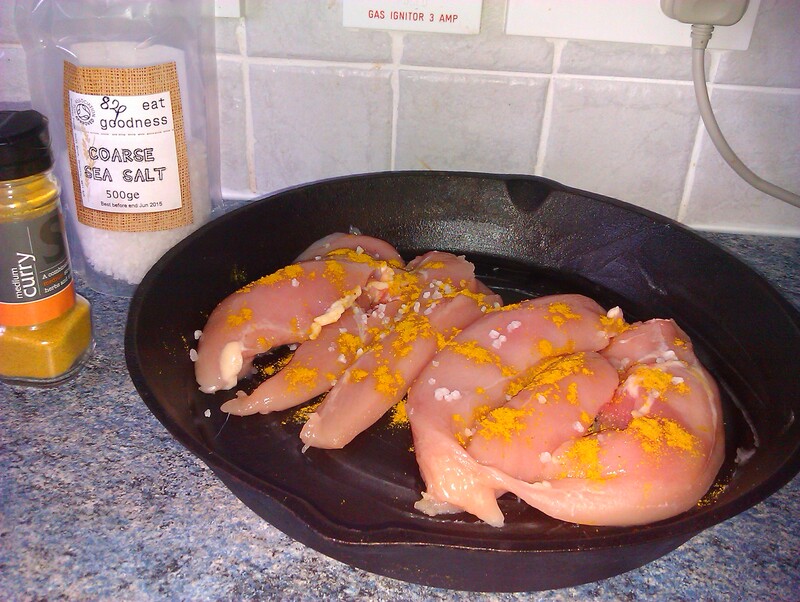 I had defrosted some organic chicken breast from the previous night and prepared it simply by popping it in the oven with a bit of coconut oil, sea salt and curry powder. It only needs around 30 minutes to roast to perfection. We love Indian in this house but as you well know, Indian takeaways can be quite calorific so over the years I learned to make my own version of things. I had a great helper, one of my very good friends, who is from Pakistan and who taught me how to mix up spices. 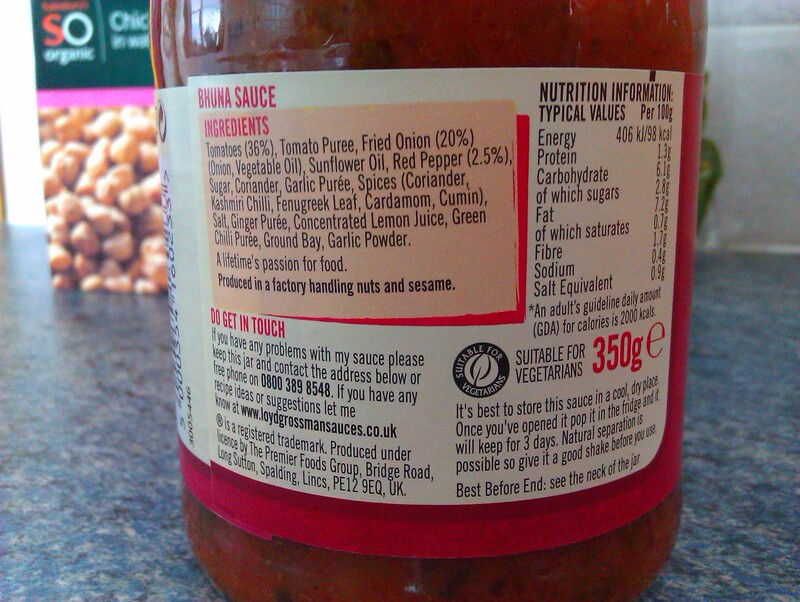 But today I present you with a Nigella-like express recipe in which I used a bought-in sauce. Before you gasp and call me a cheat, let me tell you that my sauce has been carefully chosen to have only natural ingredients and have less than 100 calories per 100 grams. There, is that better? 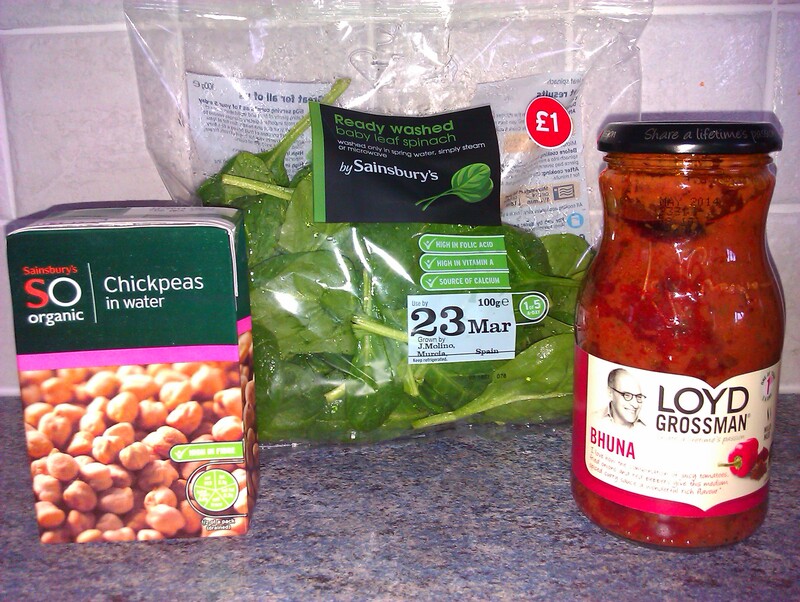 I also dug out from my cupboard some chickpeas and thought that the spinach I got this morning in Sainsbury’s could also be put to good use. 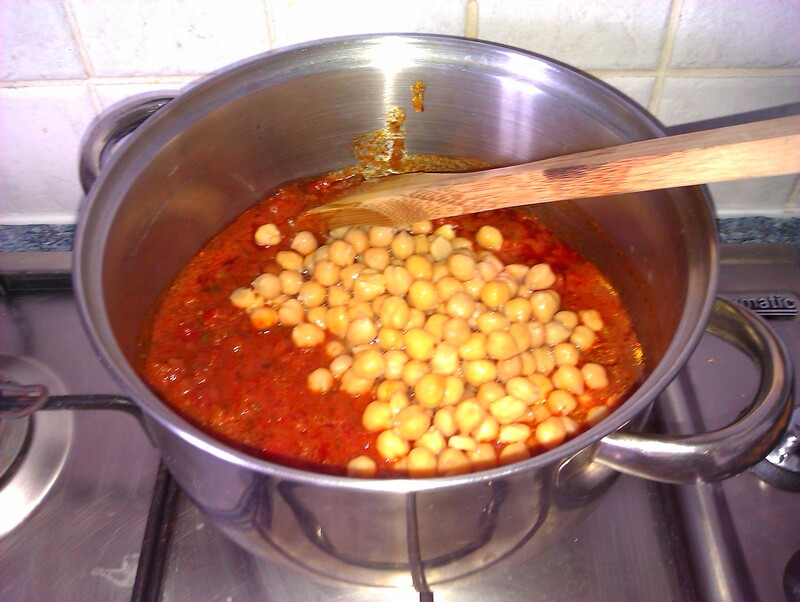 Assembling all this was easy peasy: just warm up your sauce ever so gently then add the chickpeas and let them simmer for around five minutes to get infused with the flavours from the sauce. 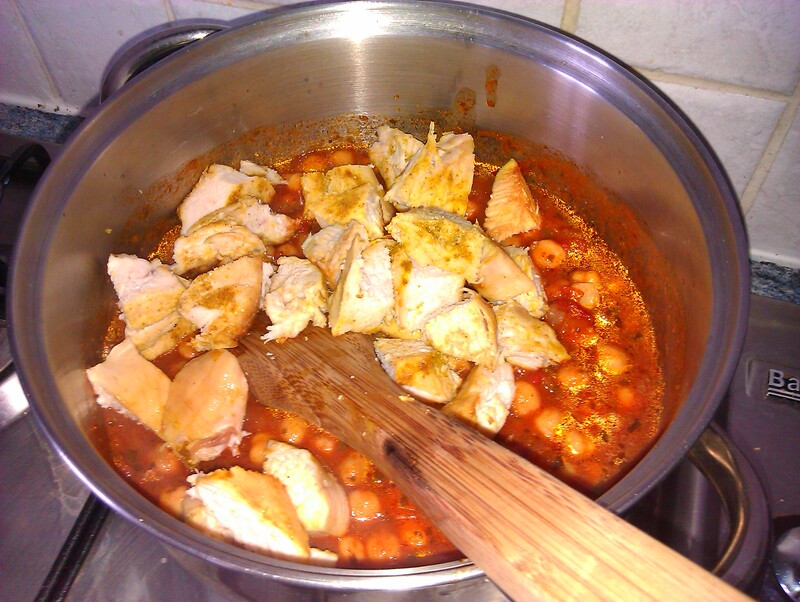 Meanwhile, remove the chicken from the oven, cut it into bite-size pieces and add it to the sauce and chickpeas. Again, let it simmer for around five minutes or so, in order to blend in with the rest of the ingredients. Turn the heating off then add your chopped spinach. And there you have it, dinner ready! I usually serve it with Indian rice. Before you panic and tell me you don’t know how to make such things, let me share another easy peasy recipe for that. I usually put a cup and a half of Basmati rice with about two and a half cups of water to boil. I then add a bit of salt, two cardamom pods, half a teaspoon of cumin seeds and half a teaspoon of turmeric powder to the rice. I let it boil gently for about 15 to 20 minutes until water is absorbed and the grain is soft. All in all, this meal shouldn’t take you more that 50 minutes, including cooking the rice. 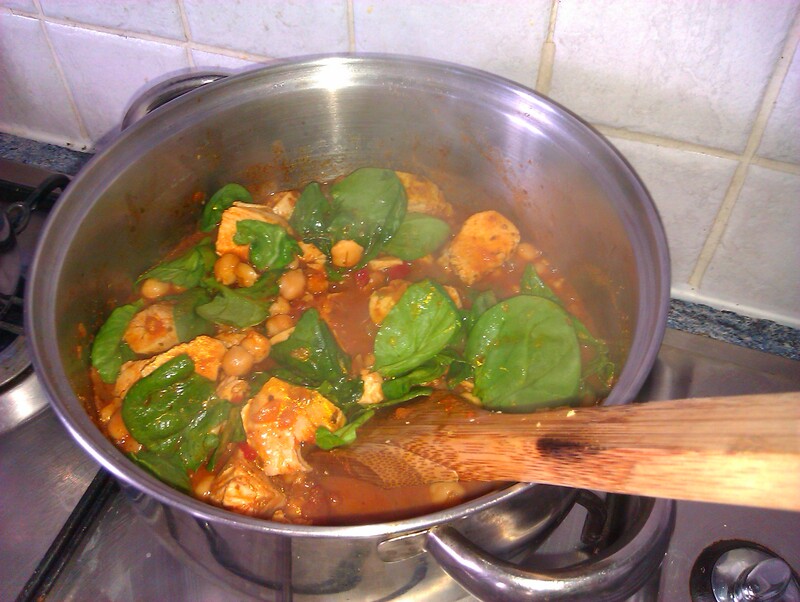 You only need chicken, Bhuna sauce (and no, it’s not hot so you can have it even if you can’t take hot food), chickpeas, spinach and rice. It should also come at under 500 calories per serving, pretty good for a dinner including rice! This is day 26, there are only two weeks left of my healthy living challenge, stay well, cook smart :-)!